The Philippine National Police (PNP) here recently established its own tourist police to ensure the security of tourists and protect tourism sites in the city. According to PNP City Director PC/Insp. Charlie Cabradilla, the said local tourist police will work at important tourist spots in the city especially at the city boulevard. 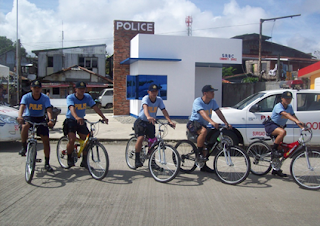 The unit will discharge their duties round the clock to check crimes and guide the tourists, said Cabradilla. Earlier, the Surigao City Tourist Police Outpost located at the City Boulevard was successfully inaugurated on December 22, 2010 as a gift of Surigaonon Rural Banking Corporation (SRBC) through its Chairman Alfredo T. Bonpin to the Surigao City PNP and to all the Surigaonons. City Mayor Ernesto Matugas, on the other hand, donated five bicycles to the city PNP.